One of the Marine Corps’ most senior officers has just joined the revolution. I recently have come to appreciate blogs as a way a leader can share his thoughts while also collecting feedback from a broad group with a wide variety of perspectives. I’ve been particularly impressed with the United States Fleet Forces Command Blog started by Admiral J.C. Harvey, and my goal here is to pursue a similar course. It’ll be interesting to see where the general takes it. Harvey’s blog offers a mixture of observations and situation reports, allowing the admiral to draw attention to naval exercises and other military operations as he sees fit. Hejlik said in his initial post that he will be posting regularly about the forthcoming Bold Alligator exercise in the next few months, but he’ll touch on other things, too. Ain’t technology great!! Proud of ya General. We know you’ll make it work for you and the Corp. So proud of you & all that you have done for our country & also to the Hejlik family. There is no one like you Denny! Keep it going strong!! Hugs & love always to you & Sandy! Proud of your accomplishments! Our hometown hero! Always proud of you and Sandy, Denny. Can’t wait to visit about your adventures. My son, Chad, continues to be proud of his time in the Navy. Herb’s son, currently in the Marines. We need you to keep us safe here at home! Thank you! Proud to know you and Sandy and looking forward to more good times. So proud of you Uncle Denny and all of you have done for our BIG family and our country! Hope to see you soon! So proud to know you! The entire town is in awe of all your accomplishments and service to our country! May God bless you and Sandy for your lifelong dedication to help us continue to enjoy living in the land of the free! What a nice surprise to see your blog. Good to hear you are doing well. I will be checking for updates…hugs. Read about you all the time you are amazing. Brother Jim and I plan on coming out this fall to see you all. It’s been awhile. 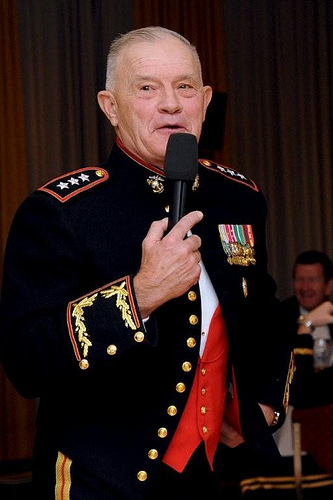 It will be interesting to see what the General discusses regarding leadership principles and leading Marines. I look forward to his inspirational comments and information. God bless you and your familiy Sir. I had the pleasure of serving under your command as a CPL in 1st BN 2nd MAR. I still carry your leadership traits to this day and continue to pass them along to those under my charge. I consider it an honor to know you on that level. I will never forget your “speed walking” as will many under your charge. Semper Fi Sir. Lost track of you and Sandy after your discharge in 1972 (H&MS-31). Congratulations on your storied “second” career. Thank you and your family (we know they also serve) for your service. God bless & Semper Fi. Congratulations, Gen. Hejlik, on your most recent accomplishments! I was your Personnel Chief in your 1st command (E 2/5, 1st MarDiv) in 1977-78. I was a young Sgt. then. I’m still anticipating your appointment as Commandant! Best wishes, Sir!! Sir, I’ve been following your career from the sideline and I’m very proud of all your accomplishments. I am honored to have served under your command at 1st Bn/2nd Mar ’93 to ’93 (Cpl Austin-Diaz). Thank you for your dedication and sacrifice to our country and our Corps. Semper Fi! I too have followed your career and am proud to have served with you in Millington Tenn. Truly enjoyed spending Thanksgiving with you Tommy and your sister in St. Louis. Denny: Have been involved with JCOC for a couple of years. Have thought of you many times over the years whenever I am in DC, Chicago, or Longboat Key where I now spend most of the year. And–congradulations on your career and my best-in civilian life.